Nevada is the first state in line to legalize it in 2016 after the legislature failed to act this week, a controversial Ohio legalization initiative wins a preliminary approval to move forward, there was a major dark web drug bust in Germany this week, and more. DC Cannabis Campaign to Host Pot Seed Exchange. The folks behind the Measure 71 marijuana possession and cultivation legalization initiative will be hosting two seed exchanges this month. "This will be DC residents' opportunity to share seeds with other adults and start down the path of legally growing your own cannabis in the safety and privacy of your home," the campaign announced Thursday. Nevada Will Vote on Marijuana Legalization Next Year. After the state legislature failed to act by a deadline today, marijuana legalization is headed to the ballot next year. Initiative organizers have already taken all the necessary steps for the vote to take place. The legislature could have approved the initiative itself, but instead punted. Read the initiative here. Ohio Attorney General Approves Petition Summary for Responsible Ohio Legalization Initiative. The attorney general's approval means ResponsibleOhio now goes to the Ohio Ballot Board for its approval. Their meeting will take place in about 10 days. Read the ResponsibleOhio initiative here. If the Ballot Board approves, ResponsibleOhio must then gather 305,591 valid signatures of registered Ohio voters from at least 44 of 88 counties to get the measure on the fall ballot. Federal Medical Marijuana Bill Gets New GOP Cosponsor. A second Republican senator has signed on to the Compassionate Access, Research Expansion and Respect States (CARERS) Act (Senate Bill 683). Sen. Dean Heller (R-NV) joins fellow Republican Sen. Rand Paul (KY) and Democrats Cory Booker (NJ) and Kirsten Gillibrand (NY). Georgia Senate Passes Restrictive CBD Cannabis Oil Bill. The Senate passed Senate Bill 185, which would allow parents bringing CBD cannabis oil into the state to treat their children with epilepsy to be exempted from criminal prosecution, but would not allow medical marijuana in any other form and would not let adults or children with other diseases use it. The House has passed a broader CBD bill; the Senate Health Committee chair has promised it will try to reconcile the two bills. China Withdraws UN Motion to Make Ketamine a Controlled Substance. After lobbying from Canadian researchers and others who said ketamine is a crucial anesthetic for poorer countries, China today withdrew its motion before the UN Committee on Narcotic Drugs to schedule the drug. The Chinese said they would defer their resolution for another year so ketamine can be studied more. 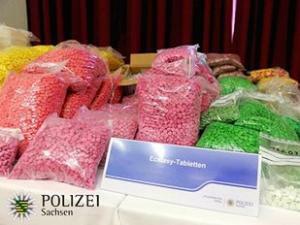 Germans in Major Dark Web Drug Bust. Police in Leipzig announced yesterday that they had raided 38 locations and arrested seven people, as well as seizing more than 700 pounds of cocaine, ecstasy, LSD, amphetamines, marijuana, and hash. The bust was of only one seller on the dark website Evolution, but the Deep Dot Web blog, which closely tracks the online narcotics trade, calls the law enforcement operation the biggest Dark Web drug bust ever. Still, the vendor busted represented only a fraction of the 20,000 drug listings on Evolution, and that's just one dark web drug sales site. Saudi Arabia Beheads Three For Drug Smuggling. A Yemeni, a Syrian, and a Saudi national were executed in the kingdom this week for smuggling amphetamines and hashish into the country. That makes about 20 drug executions so far this year in the county, about half of the 43 executions reported so far. We're talking amphetamines and Hashish,right?How can anyone take someone's life for amphetamines?Even worse how can they kill for hashish?The punishment is so outrageous for anything,even mass murder.But for smuggling hash?For smuggling anything?How is this going on in a major US ally?